Properly caring for a wound on your foot or leg will help it heal faster, avoid infection, and prevent further complications from arising. This article will go over some common types of wounds, treating them at home, and whether or not should see a foot doctor/lower extremity wound specialist. Superficial– This is a cut, or abrasion that only affects the top layer of skin. Deep– A deep abrasion is classified as a cut or laceration that extends to the deeper layers of skin, possibly into the underlying muscle or bone. Puncture– A puncture wound is generally a small hole caused by a sharp, pointed object entering the skin such as a nail. Diabetic– A wound that occurs because nerve function is reduced often at a site of high pressure on a boney area. Pressure– A wound that occurs which long periods of bed rest or while in a cast. Typically symptoms of such wounds include pain, bleeding, and swelling. Depending on the location of the wound, all types of wounds can bleed, though puncture wounds tend not to bleed very much. People with problems with nerve function (neuropathy) often have no pain until their wounds become quite severe. People with poor circulation will have very little bleeding but a great deal of pain. Ulcerations from circulation problem are very difficult to heal. First, know that a little blood is good. When your wound bleeds, it’s cleaning the area. White blood cells work to fight infection-causing bacteria. Light pressure and elevating the wound should stop the blood flow pretty quickly. Keep your wound clean with cool water and antibacterial soap. Apply an antibiotic cream but AVOID OINTMENTS and PEROXIDE, as they actually reduce the ability to heal. Antibiotic creams can help keep your wound moist and reduce the risk of infection. If the wound requires a bandage depends its type and severity. Is it in a place that might be rubbed or scraped, is it draining and if so how much? You should change bandages not less than 3 times per week and choose a fabric over plastic variety whenever possible. Keep the healing wound clean and change the bandage, as needed. 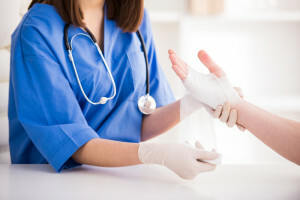 If your wound is the result of surgery, care may be largely the same, but be sure to follow and special instructions your doctor has given to you. It’s very important that you understand the severity of your wound and take appropriate action. For many wounds, at-home treatment is perfectly fine. For some, though, a doctor’s intervention is absolutely necessary. For those with diabetes, poor circulation or nerve problems, a doctor should always be consulted, even if the wound seems minor. If your tetanus immunizations are not up to date, you should see a doctor to determine if a booster is needed. If you’re ever unsure, it’s best to check with a doctor. A history of medical problems such as diabetes, poor circulation or reduced nerve function. If you have any further questions or would like to make an appointment with a foot doctor/lower extremity wound specialist, call Orthopaedic Associates of St. Augustine today at 904-825-0540.